Oy. :) This was a bit of a long weekend. Why, you reasonably ask? Well, there's a lot going on right now between work getting busier for me with classes starting next week, prep work heating up for Mike since he will start teaching (a record 6 classes) again next week, and a minor health crisis with my father-in-law. And the children. Well, let me correct that. Henry really isn't the problem. :0 It's *our daughter*, but we'll come back to that in a moment. Friday and Saturday were just really long days, chock full of summer activities. While fun, I was feeling a bit drained by Sunday. So, let's talk about Sunday. I feel like we're at a bit of a crucial point in this long stretch of Ordinary Time. We just passed the Feast of the Assumption, always a high point of late summer for me. Once September begins, tons of good saint feast days come upon us, and it seems like Advent is right around the corner. Right now, we're at this point wherein most of the church musicians are off rotation until after Labor Day and parish activities are still in slow mode with Vacation Bible School wrapped up, but transition back to the hectic nature of the fall is in the air. We should enjoy these last quiet moments. And so I brought the children to Mass on Sunday longing for that spiritual respite. For the most part, I received it. It's hard to hear the readings when every week I'm inevitably in the bathroom assisting Anne on the potty (I know all you parents of toddlers feel my pain :0) but my kids really are pretty good during Mass and I get to hear and enjoy a lot of it. 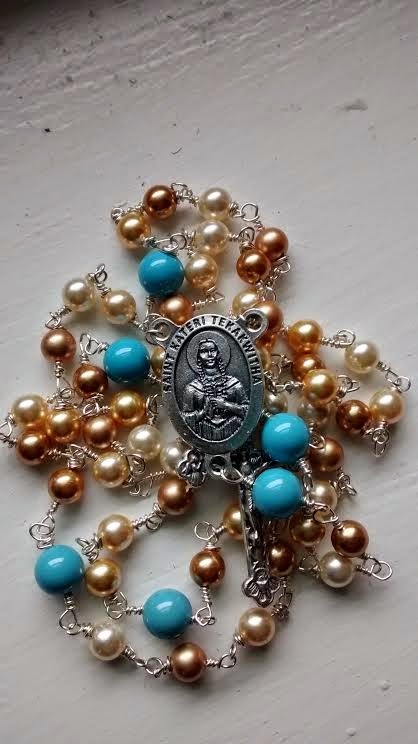 Anne started to throw a fit when we arrived because I denied her permission to abscond with free, blessed plastic rosary #3,587 in the side vestibule, but a stern talking to before entering the sanctuary seemed to do the trick. Henry whined a bit on the ride over about "having to go to church AGAIN!! Weren't we just here?!" but he piped down and was well-behaved, especially with the promise that he could light a candle after Mass. Poor Henry also was low on clean laundry when we left the house and was horrified by the pants I made him wear - which is to say a pant-item made of something other than denim. These were DRESSY PANTS, dredged from the back of his closet in desperation, and he wasn't happy. "Mommy. These pants...don't fit me real good." I turn with a squirming Anne tucked under my arm to survey Henry walking rather oddly. "Well. They kind of...hurt. I think they're, ouch! Too tight." "Oh. Well, it's too late to turn back, Honey. We're already running late. Can you just unbutton them?" "Your shirt will cover it up, Honey, and at least that way you'll be more comfortable." He wasn't happy, but he acquiesced. And Anne was pretty good, although she has started trying to hoard the collection envelope and requires intervention at that time to make sure the envelope actually gets into the basket. She always seems just on the very edge of a tantrum when I do this, but so far no meltdowns, for which we should all kneel down and thank God. All went well, and the kids did team up to light a candle at the conclusion of Mass ("I want to hold the candle!" "Anne, give it to me." "NO!" "Well, I'll put the money in, but you have to give it to me when we get out by the altar." "NO!" "Anne! Mommy, make her give me the candle! "), and after praying by the side of the altar near the candle stand, I felt at peace. That lasted well into the day, through my afternoon of working on re-wrapping my nephew Andrew's birthday rosary (pictured above) since the wire wraps in my first attempt weren't lookin' so good, cooking a big dinner for us and my parents, and readying the kids for bed while Mike went to visit his dad at the hospital (aforementioned minor health crisis). (1) Anne refusing to fall asleep. This required 3 hours of tag team intervention by Mike and I. (2) An alarm blaring at midnight from the vicinity of the downstairs. Some little fingers had obviously turned it on in the guest room during the day at some point. Any guess as to who that could have been?! I was in a stupor and incorporated the noise into my dream, so Mike fielded this one. (3) 1:30 am: *Anne is crying* Given that Mike handled the alarm, I stumble into Anne's room to see what the what is. Sometimes she just needs an extra cuddle or a diaper change. Not that time, my friends. "Mommy. I AM NOT SLEEPY!!!!!!!!!!!!!!!" Heretofore began a battle which entailed a full out temper tantrum (mostly by Anne :0) with lots of sobbing and throwing of body on the floor. Mike came in to try and relieve me, which went as predictably poorly as any reasonable measure could have at that point ("NO DADDY! NO DADDY!"). Eventually, I just left her in there and went back to bed, feeling like a terrible mother. I don't think a person ever feels like a good mother when they are exhausted, it's 3 am, and your toddler appears possessed, you know? When Mike went in a second time, she was too exhausted to put up much of a fight, and things were fine after that. But by that point it was nearly 4 am and we were wide awake. When it was time to get up for work near 7 am, I felt like death warmed over. So, so not fun, gentle reader. "...We are now beginning in very earnest to experience the contemplation which consists in suffering with Christ, and the way to sanctify it is not so much to suffer with him as to ask him to let us realize that he it is who suffers in us. For, this understood, we cannot help abandoning our will to his completely, and letting him suffer in us in his way, and his way is the way of love. Complete though it is, in his grief there is no bitterness; and what seems to be frustration and waste is not, it is fruitful; this is because every moment of his Passion is informed by love." And yep, made me feel so much better. Sublime. I feel strengthened for the evening and have hope that things will get a little easier. I know it's a small thing, this Terrible Two's universe I'm living in right now, but emotionally it can take it's toll over a long stretch, especially when combined with a bunch of other anxieties.